Goths throughout Britain who have barely cracked a smile since their invention in the 1980s may finally be able to cheer up a bit and stop sitting woefully in grave yards eating liver, according to a report highlighting plans to entertain them with the Chuckle Brothers. 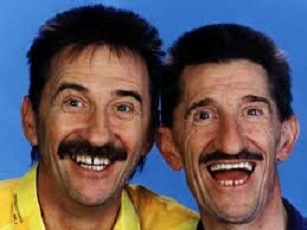 The leaked report details plans to replace forthcoming Sisters of Mercy gigs, (thought to be the highest concentration of goths in decades), with the live adventures of Barry and Paul Chuckle. Those expecting to hear Andrew Eldritch and his famous drum machine friend Dr Avalanche will instead be spectators to a slap-stick display of the northern comedy duo moving some largish object from one side of the stage to the other to hilarious end. One source close to the singer said “Eldritch couldn’t actually perform at the gigs anyway. Since being entertained by the Chuckle Brothers himself he’s been bouncing around smiling, giggling, has let his hair go back to it’s natural mousey brown and has developed a high pitched voice, a bit like Timmy Mallet. We were unable to contact 1980s goth band Fields of the Nephilim. “Probably another case of the Chuckle Brothers working their magic” One source told us.